Paraneoplastic neuromuscular disorders though rare are an important group of conditions. Prompt recognition of these syndromes should lead to a careful search for an otherwise occult and often treatable cancer. However, in practice , such a search is not only expensive but its yield is often low. the current understanding of these syndromes doest not yet permit formulation of practice parameters for a cost-effective search for systemic cancers in such a setting. This article, based on the current knowledge of these syndromes, attempts to formulate certain broad guidelines to make the search for systemic cancers in patients with suspected paraneoplastic neuromuscular syndromes, judicious and more cost-effective. A careful clinical evaluation couples with an evidence-based investigative approach remain the pragmatic method to evaluate patients with suspected paraneoplastic neuromuscular syndromes. The major objective behind cancer screening in a patient with suspected paraneoplastic syndrome is to detect and treat the cancer early with a hope that this may improve the neurological syndrome, and, thereby, the duration and quality of survival. Writer's cramp is undoubtedly the most frustrating and difficult focal dystonia to treat. We treated 33 patients (32 males and 1 female) with writer's cramp with EMG-guided injection botulinum toxin (BTX). Muscle selection for injection was done clinically. Their mean age at presentation was 39.48+9.38 years (range 18-57 years) and mean duration of symptoms was 3.84+4.15 years (range 0.3-20 years). A detailed clinical assessment and video-taping while writing was done. Fourteen (42.4%) of the 33 patients received injections in forearm extensors, 10 (30.3%) in flexors and 9 (27.3%) in both extensors and the flexors. Mean dosage of BTX used for initial injections was 127.7+28.4 units of Dysport and 22.9+3.1 units of Botox for twenty-tow and eleven patients respectively. Functional improvement was seen in 30(93.75%) and was marked to striking in 15(46.9%) of 32 patients who reported for follow-up. More patients with extensor (44.4%) patients with both flexor and extensor involvement had similar response. While BTX therapy is currently the most effective therapy for Writer's cramp, it is also the most challenging indication for BTX. This is a technically demanding procedure requiring meticulous documentation. 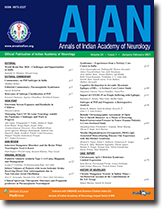 We report our experience of managing 6 patients with numerous cerebral cysticerci. Their age ranged between 5 and 45 years and 3 of them were females. All of them presented with clinical symptoms and signs of raised intracranial tension with partial seizure n 3 and behavioural abnormality in one patient. The diagnosis of cysticercosis was based on characteristic CT or MRI findings or both in all six, biopsy of subcutaneous nodule in two and igG ELISA for cysticercosis in one patient. Of the two patients who received albendazole therapy one died and other deteriorated. Four were managed with only antioedema measures including corticosteroids, of which one recovered completely and 3 partially. One of the patients on chronic corticosteroid therapy died because of staphylococcal septicemia. Cysticidal therapy in patients with numerous cerebral cysticercii may be dangerous. It is suggested that albendazole therapy may be avoided in patients with numerous cerebral cysticercii and these patients should preferably be treated with antioedema measures and antiepileptic drugs and corticosteroids. A case of Becker's Muscular dystrophy (BMD) in a 26-year-old male is reported. Muscle biopsy immunohistochemical staining showed absence of labelling for dystrophin along the sacrolemmal membrane in majority of the fibres. Antibodies to adhalin and merosin showed normal localisation along the sacrolemma.